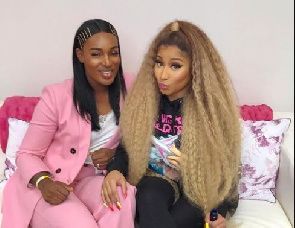 Rising Ghanaian songstress based in Holland, Nana Fofie is lucky enough to join Nicki Minaj’s fourth concert tour with rapper Juice Wrld. Known for her crazy mashups of afrobeats songs, Nana Fofie went viral last year with her numerous cover videos on her YouTube channel. She caught the “Anaconda” hitmaker’s attention last year with one of her mashups. Nicki was spotted jamming to her cover song on Instagram and gave her a shout out in her comment section. And now, Nana Fofie is on her tour. “IT IS HAPPENING! #nickiwrldtour,” she announced her first performance which took place in Amsterdam on March 25. Nana Fofie later shared a backstage photo with Nicki, heaping praises on her for the opportunity. “I wish that i could have this moment for life.” Dear @nickiminaj thank you for a life changing moment and opening all these doors. You are so sweet and genuine such an inspiration. I’ll take your loving words on board and i’ll never forget what you said…thankin you aint enough!!! #nickiwrldtour [sic],” she said on Instagram.